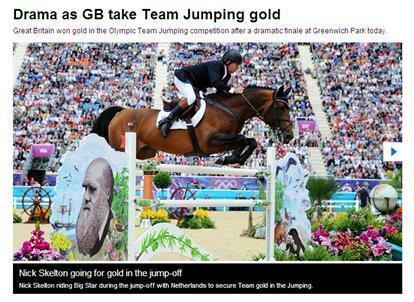 The London 2012 Equestrian – Olympic Team Jumping competition at Greenwich Park displayed blatant marketing for Darwinism, with mural displays of Darwin, the Monkey Scientist, and icons associated with evolution from The Gospel according to Charles, more commonly know as On the Origin of Species. It was equally surprising that Saudi Arabia clinched bronze but felt comfortable with the Darwinist images. Perhaps Wahhabi thought went so far off the religious and political spectrum that it merged with evolutionism. All in the name of catching up with the rest of the developed world of course. Since evolution is a so-called theory that is not provable enough, as opposed to Creationism and the new anti-Darwinist Intelligent Designism (enough of isms), we shall waste no more time and share the golden moment. For all other Games-time complaints, you can get in touch with us in a number of ways as detailed below. Please provide as much information as possible to help us deal with your complaint more quickly. Call us on 0808 197 2012. Hours of operation are Monday to Sunday 9am–6pm. Email us at complaints@enquiries.london2012.com or by using the web form below. Write to us at: Complaints, Communication and Public Affairs, The London 2012 Organising Committee, 23rd floor, 1 Churchill Place, London, E14 5LN.